NEW YORK, February 28, 2012 — Asia Society brought together Central Asia experts Philip Shishkin, Asia Society Bernard Schwartz Fellow and Reuters Senior Correspondent; David Merkel, former Deputy Assistant Secretary of State for European and Eurasian Affairs and former Director for Central Asia at the National Security Council; Dr. Sean Roberts, Director of the International Development Studies Program at George Washington University; and Justin Burke (moderator), Managing Editor of EurasiaNet.org, to address the region's fundamental governance challenges. 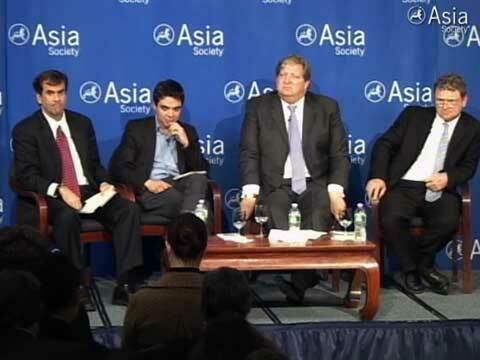 Centered on political risk and presidential succession, Central Asia's role in Afghanistan, and the region's increasing strategic importance to its neighbors' energy security, the discussion was held in conjunction with the release of Asia Society's report, Central Asia's Crisis of Governance. The conversation opened with a focus on the political difficulties surrounding presidential succession, a major contributor to the largely autocratic region's governance challenges, as the region generally lacks democratic processes that provide mechanisms for the transfer of power (and the sources of that power). Roberts discussed these issues and noted, however, that chances of an "Arab Spring" scenario taking root in Central Asia remain slim, due to a "cynicism…about democracy." Logically, Central Asia's vast natural resources bolster its interest to external actors. Merkel noted that Central Asia is an "enduring policy priority" for the United States and the European Union, but stated that these actors don't seem to maintain their interest in the region, illustrated as the U.S. exits Afghanistan. Instead of adopting and implementing a long-term strategy within the region, Western involvement generally comes, Merkel elaborated, through singular "democracy, energy, or security prisms." Adding to Merkel's assessment, Phillip Shishkin stated that U.S. involvement in the region throughout the past decade has primarily been determined by security and logistical concerns stemming from the military campaign in Afghanistan. This highlights the "security vs. human rights" dichotomy that has often been a source of contention in U.S. policy toward Central Asia. In response to a question on whether the "Northern Distribution Network has been a blessing or a curse for democratization in Central Asia," Shishkin concluded that it's "been largely a curse." Although the region's governments are long-lasting, he noted that governments that oppress their people are inherently unstable, and if the government changes, foreign powers and policies that allowed for human rights abuses may find new governments less willing to cooperate. As an example, Shishkin pointed to criticism of the U.S. during the 2010 Kyrgyz revolution. Shishkin concluded, however, that Central Asia does want the U.S. to stay engaged in the region "if for no other reason than to provide strategic counterweight to Russian and Chinese influence." This being the case, an argument can be made for future U.S. policy to be more attuned to human rights issues in the region.